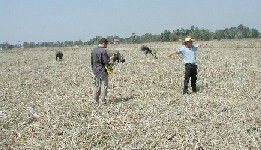 In the last section, we learned that Nang Rong was not an easy place to get to until about twenty or thirty years ago. One reason was that heavy rainfall washed out many of the roads during parts of the year. In this section, we look at the unique climate in Nang Rong and the adaptations made by the locals to the climate, especially the seasonal patterns of rainfall. If you were going to travel with us to Nang Rong, what type of clothing would you pack? The answer depends on when you plan to visit. From November through February, temperatures are mild and rains are infrequent. This period is sometimes called the "cool season" or "dry season." Those who consider 68° F (20° C) cool may wish to pack long sleeves. As February turns to March, temperatures rise to a peak around mid-April, while rainfall remains scarce. 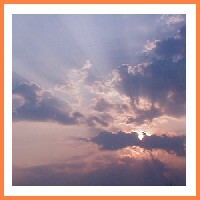 This time is called the "hot season," when the temperature can climb to over 100° F (38° C) during the day. If you should travel to Nang Rong in April or May, be prepared for serious heat! With May and June come the first substantial rains of the year and with them a welcomed end to the dryness. The heat remains, though, and combined with the rain can make for a truly unpleasant stay if you are not prepared for it. In an average year, residents of Nang Rong can expect to receive about 120cm of rain, or nearly four feet! Some Thais do not even carry umbrellas during the wet season. In the torrential downpours that occur, an umbrella only slows down the process of getting thoroughly soaked from all sides by a minute or two, so why bother? Careful observers will notice that it is not called the rainy season, it is called the wet season. The weather in Nang Rong varies tremendously over the course of a year. The topography, on the other hand, does not. Topography refers to the heights, or elevation, of different features of a landscape. A place with drastic changes in elevation over a short distance - mountains, valleys, and so on - is said to have high-relief, while a relatively flat expanse would have low-relief. Look at the following pictures of Nang Rong taken by team members over the years. Would you say Nang Rong has mostly high-relief or low relief topography? The presence of just one of these two features - heavy rainfall during the wet season and low-relief topography - by itself would make Nang Rong a very different place than it is in reality. If Nang Rong were filled with steep mountains and valleys, even the heaviest rains would quickly run off, possibly leading to the flash floods experienced in mountain regions like the <?xml:namespace prefix = st1 ns = "urn:schemas-microsoft-com:office:smarttags" />Appalachian mountains of the US. On the other hand, a flat Nang Rong without heavy rains during a few short months would not support the chief agricultural activity: rice growing. 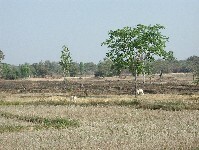 Without the rains, Nang Rong might well be an arid desert landscape. ABOVE: Big jugs for collecting rain water running off roofs are a fairly common sight in Nang Rong. It is often the case that better-off families purchase larger and more expensive jugs like those shown here. It is the interaction of the climate and topography that makes it possible to grow rice in Nang Rong, something the local population has done for centuries. By building small earthen barriers (called bunds) that rise a foot or two above the level, the population of Nang Rong very carefully collects nearly all the water that falls on the surface and keeps it in place for many weeks to form the shallow pools of water needed to grow rice. The photos that follow show rice fields, or paddies, in various stages of growth. 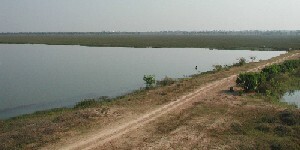 The bunds keep the water from running off the surface into streams and rivers, and provide a dry walkway surrounding the rice paddies. The paddies function like giant bowls, collecting whatever rain falls during the relatively short wet season. 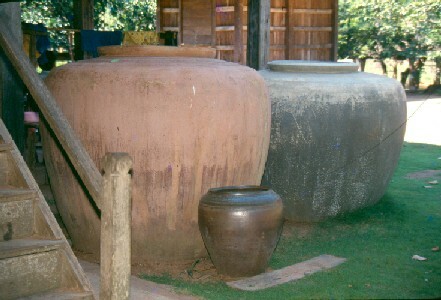 Households likewise use giant jugs or jars near their houses to collect rain as it runs off the roofs to use for drinking and other household activities. These jugs can be huge, some big enough to hold hundreds of gallons of drinking water. LEFT TO RIGHT FROM TOP: 1. 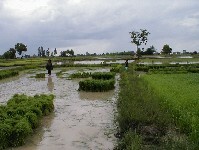 Bundles of rice seedlings ready to be transplanted from the nursery beds to the actual paddies, now filled with water. 2. 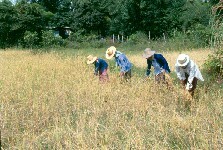 A mature field of rice being harvested by women dressed for the heat and using hand sickles. 3. 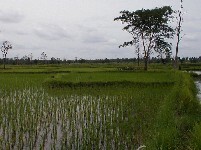 A paddy planted early, surrounded by several paddies that have been plowed but not yet planted. Variation in planting times helps buffer families from unexpected droughts or too much rain. 4. More bundles of rice ready for transplanting to paddies. 5. 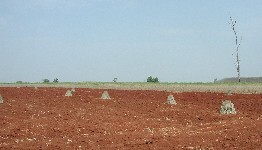 A newly planted paddy. While we are talking about the topography of Nang Rong, there is another group of crops that is grown in Nang Rong that is also highly dependent on being planted at the right elevation. Cassava is a crop that produces a large root that can be eaten by both people and livestock. Kenaf, another crop that was widely grown in the past, produces strong fibers that can be used to make rope. 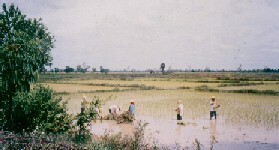 These crops are known as an upland crop because, unlike rice, they would drown if planted in the standing water of the paddies. Cassava and kenaf were not planted widely in Nang Rong until recent decades because the local population did not have much use for either. But with the extension of roads into the area that you read about in the Last Section, farmers were brought into closer connection with the broader world beyond Nang Rong. There were many people in places far removed from <?xml:namespace prefix = st1 ns = "urn:schemas-microsoft-com:office:smarttags" />Northeast Thailand who did want cassava and kenaf. These people were willing to pay for these crops, and so they are often referred to as cash crops. With new markets for cash crops, many farmers saw an opportunity to do something with the high areas surrounding village that were not well-suited for rice growing. They planted these uplands with cash crops and crossed their fingers hoping that the market would pay them a good price when they were mature. If the crops did reach maturity, they were sold to middlemen who carried them away to buyers in places as far-off as Western Europe. This story may not seem to relate to much now, but as we will see, the factors that helped make cash crops profitable for Nang Rong farmers contributed to another major change in the landscape of Nang Rong: deforestation. RIGHT TO LEFT FROM TOP: 1. 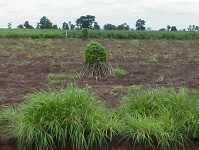 A young cassava plant. 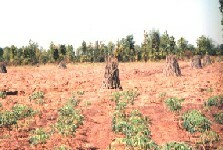 2-4 Mature cassava bundled for transport to market, or to be used to replant fields for the following crop.